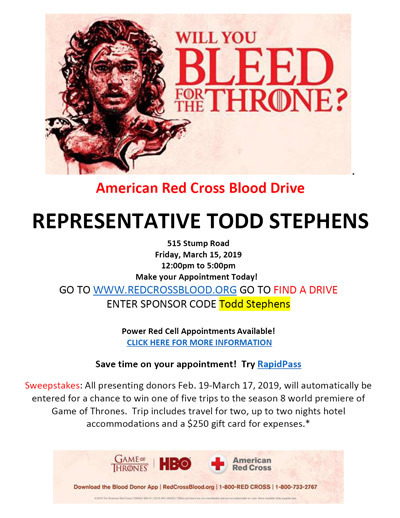 Come to my blood drive on Friday, March 15, at my office, 515 Stump Road, and be entered for a chance to win one of five trips to the Season 8 world premiere of Game of Thrones. Details are in the flyer. The program would provide for 10 semesters of tuition-free education for family member(s). The benefit must be used at a Pennsylvania Higher Education Assistance Agency approved educational institution, and at the tuition rate set by the Pennsylvania State System of Higher Education. Making sure every dollar of state tax money is used to its maximum benefit, the House Appropriations Committee wrapped up its three-week series of budget hearings, with the committee looking into all aspects of the governor’s budget proposal. The committee heard testimony and asked questions of the departments of Education, Agriculture, and Military and Veterans Affairs, as well as the Public School Employees’ Retirement System and State Employees’ Retirement System. The Appropriations Committee will take the testimony gathered from these hearings into negotiations for the 2019-20 budget. All of the hearings are available here. With March being observed as National Problem Gambling Awareness Month, officials from the Department of Drug and Alcohol Programs, the Pennsylvania Gaming Control Board and the Pennsylvania Lottery highlighted the warning signs of problem gambling and available resources to help. Gambling can become a problem when a person develops strained relationships with loved ones; borrows money to gamble; gambles to get a “high”; or misses work, school or other activities and obligations in order to gamble. In the Commonwealth, the Council on Compulsive Gambling of Pennsylvania works to educate Pennsylvanians on compulsive and problem gambling to prevent development of dangerous gambling habits. It operates the Pennsylvania Problem Gambling helpline, 1-800-GAMBLER (1-800-426-2537). More resources, including a 24-hour chat service, are also available at pacouncil.com. Click here for more information on how to recognize the warning signs of a gambling problem. Click here to find information about treatment options.